Missing Ely’s Sky – 23/365, Archive 365, Droid Shots, Ely, Minnesota, photo © 2012 by Liz Schultz. All rights reserved. 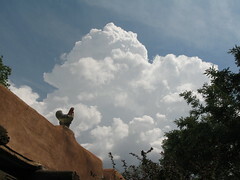 Taos, New Mexico, photo © 2007-2012 QuoinMonkey. All rights reserved. Clouds are connectors. 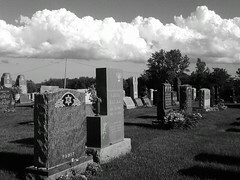 We see cloud formations as recognizable, weather predicting puffs of air. Clouds are classified using a Latin Linnean system based on a book written by a London pharmacist, Quaker, and amateur meteorologist named Luke Howard. 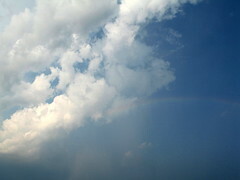 In 1803, he wrote The Modifications of Clouds naming the various cloud structures he had studied. 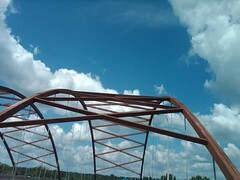 New Hope, Minnesota, photo © 2010-2012 QuoinMonkey. All rights reserved. The terms used by Howard were readily accepted by the meteorological community and detailed in The International Cloud Atlas, published by the World Meteorological Organization in 1896. They are still used across the world today. Stratus— means layer and refers to the group of clouds that form in big sheets covering the entire sky. Stratus clouds are made of liquid water and are called fog or mists when close to the Earth. The blend of altostratus can cause ice build up on the wings of aircraft. 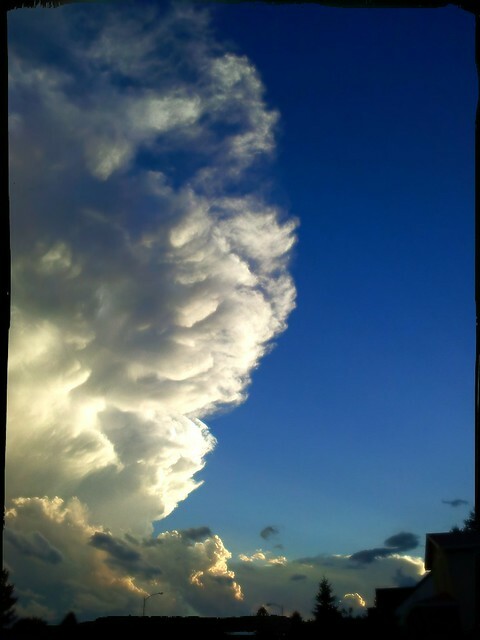 Cumulus—in Latin cumulus means heap. These are fair-weather clouds that we might say look like cotton candy or castles. Alto—means middle and refers to clouds that are in the middle layer of our atmosphere. Cirrus—means curl in Latin. These clouds are high up and look like wisps of hair. Cirrus are the highest of all clouds and are made up almost entirely of ice crystals. Nimbus—comes from the Latin word for rain. 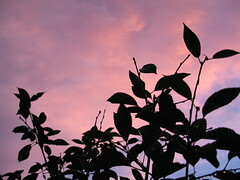 Whenever there is precipitation, there are nimbus clouds. 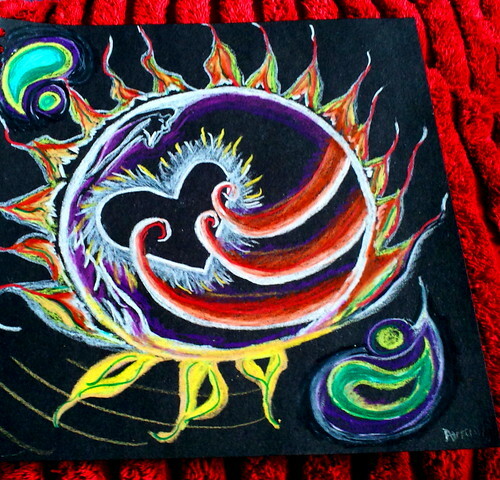 2012 by QuoinMonkey. All rights reserved. What do you think of when you say the word cloud? Do you see the Universe, fog hanging on the mountains, the sky over the prairie? How many types of clouds can you name. Or maybe cloud to you is not that literal. Is your iced tea cloudy; are there clouds in your coffee? Is there a cloud over your day or your mood? Does your past cloud your vision of the future? Get out your fast writing pens and write the Topic Cloud at the top of your spiral notebook (or start tapping away on your computer or Smartphone). You can write a haiku, tanka, or gogyohka practice and post it in the comments. Or you may be surprised at what you discover when you follow the rules of Writing Practice —- Cloud, 10 minutes, Go! 2008-2012 by QuoinMonkey. All rights reserved. 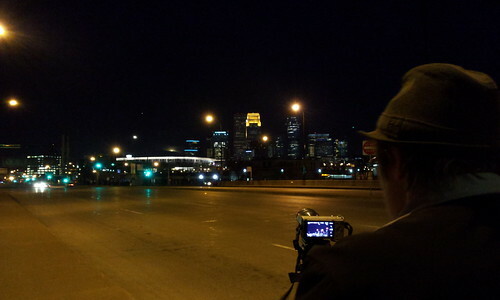 Liz Shoots The April Moon, Minneapolis at night, Minneapolis, Minnesota, April 2012, photo © 2012 by QuoinMonkey. All rights reserved. It’s hard to get back into the practice of writing for red Ravine after two months away. Where have I been? The business of life. And love. Art and passion. Mr. Stripeypants was sick for a time, a bug he contracted during surgery. He’s fine now. 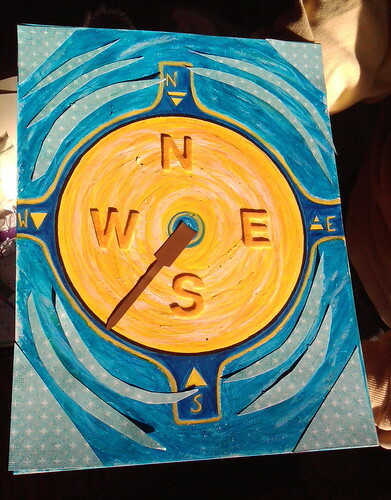 I was sick for three weeks, then it was time for Art-A-Whirl. Liz and I spent hours in Casket Arts Studio 318, talking art and writing and authors. Explaining panoramas on brushed metal and the latest installment in the Writers Hands Series. After Art-A-Whirl, I am so energized by the people that stop by that I want to spend every waking moment in my studio. My mother went to Georgia without me this year. I missed traveling with her; she continues to research the family tree. I take it up, too, in my spare time. I will never lose my passion for history — the people, places, and things that lived before us. While I was away, the seasons changed. Quickly and without apology. What would normally be Spring has bloomed as Summer. We lost a few limbs on the two cedars in an ice storm. An arborist is coming to give the oaks and cedars a trim on Monday. Where have I been? I went to see Anne Lamott at a bookstore. And Leslie Marmon Silko at the downtown library. 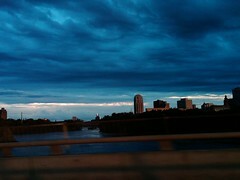 I photographed the clouds with my Droid. I stood on a bridge and shot the Moon with Liz. We are working on a business together. It’s slow and steady, like the Turtle I am. I am working on the project plan. Liz digs into business details. We will meet with a designer soon to begin work on our website. More to come. I can say I missed you. I did. When I come back to this place, it is like coming home. I have a guest piece coming up soon. 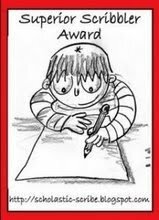 And a new Writing Topic. While I was away, red Ravine turned five. Five years and a million hits. I didn’t know when I started writing and posting my art here that years would fly by. That I would be exposed for the gaps in my practice. One year, I took a photograph every single day. Another, I wrote Writing Practices all day long. One year, there was a haiku a day. In 2012, I take time to breathe. And expand within my own absence. I have not lost my gratitude for you. There is no way to explain where the time goes. I always come back to the things Natalie taught me. Continue. Continue. Continue. Get up. Jump back in. MN State Fair Button, MN State Fair, St. Paul, Minnesota, August 2011, all photos © 2009-2011 by QuoinMonkey. All rights reserved. The Minnesota State Fair kicked off last week and for the first time since 2007, I am writing my annual State Fair piece after attending the Fair. That means I can speak from the voice of experience (that, and the fact that I spent 11 solid hours tootling around the fairgrounds last Saturday). This year there are over 80 foods on-a-stick; I recommend the Teriyaki Chicken on-a-stick from Chan’s, a new vendor for 2011. Liz and I shared the combo and topped it off with The Original Minneapple Pie smothered in cinnamon ice cream. Of course, the Minnesota State Fair is about more than food, or the debut of Peach Glazed Pig Cheeks On-A-Stick, so our State Fair posts are always chock-full of history. Last year we covered F. Scott Fitzgerald’s A Night At The Fair, Ye Old Mill, and artist Debra Frasier’s debut of the Alphabet Forest at Baldwin Park. Debra is back again this year and you can read more about her work at her official website. Or check out red Ravine dressed in her State Fair alphabet (yes, that’s me standing a letter behind). 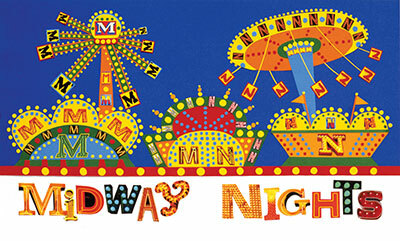 In 2011, the Minnesota State Fair celebrates its 100th Fine Arts Exhibition (over 2300 pieces were submitted in 2010). In the past, I’ve written about the history of Princess Kay of the Milky Way and the Butter Queens (2011 marks the 40th year sculptor Linda Christensen has carved their likenesses out of butter); Minnesota State Fair poster artists; mascots Fairborne and Fairchild; and the tradition of Tom Thumb Donuts. To change it up this year, I’m going to focus on the integration of the Smartphone and digital technology into the State Fair’s 150-year-old traditions. When the past meets the present, you get a gleaming new Minnesota State Fair Smartphone App and the Minnesota State Fair History Tour on your mobile! I was thrilled to download the new Minnesota State Fair Smartphone app on my Droid this year (also available for iPhone) a week before I attended the Fair . All the information I needed was right at my fingertips. The Food Finder is organized alphabetically (or you can search by food item). When you click on a vendor, all details of that vendor are listed, including a Show Map feature that pins their exact location on the fairgrounds. Other tabs include Merch Search, Fun Finder, and a colorful digital map. We used the app constantly during our 11 hour visit. Oh, and if you don’t want to download the app, you can visit the Minnesota State Fair Mobile Website with Google Maps integration. I’m grateful to Liz for pointing me to the new app. If you have a Smartphone, I encourage you to go paperless! Liz and I had a blast listening to sounds of the Minnesota State Fair’s past on the new 13-stop cell phone tour. By calling (877) 411-4123, you can hear recorded history narratives from your cell phone (or any land line), or use your Smartphone to locate QR codes, and brush up on State Fair trivia while you shuttle to the Fair’s gate. We downloaded a bar code scanner app on our Droids, scanned the QR code (Quick Response code for Smartphones) at each information board, and Whoosh!, we were jetted right to the history page for that stop. (If you press the Like button at the bottom, a link is also added to your Facebook page so family and friends can follow your tour!). The Minnesota State Fair History Walk & Cell Phone Tour offers a fun and engaging way to learn about State Fair history and explore all corners of the grounds. When you complete the self-guided tour, you receive a prize (I won’t say what it is!) at the J.V. Bailey House or (before 8pm) at the Minnesota Historical Society’s booth on the first floor of the Grandstand. Tour brochures are available at information booths and the 13 tour stops. The tour is presented by the Minnesota State Fair Foundation and the Minnesota Historical Society. Spaghetti & Meatball Dinner On-A-Stick, Fried Fruit On-A-Stick, Macaroni & Cheese On-A-Stick, Bull Bites, Deep Fried Tater Tots On-A-Stick, Grilled Shrimp On-A-Stick, Vintage Kids & Fair Food!, Leprechaun Legs, MN State Fair, St. Paul, Minnesota, August 2008, all photos © 2008-2011 by QuoinMonkey. All rights reserved. Our Minnesota State Fair post wouldn’t be complete without the annual foods on-a-stick list. Here’s the lineup for 2011 (the Sweet Corn Ice Cream really hits the spot). If you are looking for the location of specific foods at the Fair, here’s a link to their FoodFinder with a map of the Fair (0r use the Smartphone app I wrote about above!). 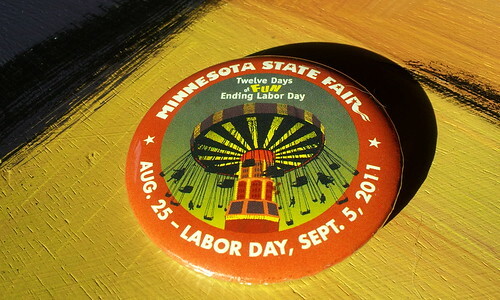 The Minnesota State Fair runs through Monday, September 5th. And if you happen to eat just a little too much, feel free to visit the brand new 5,500 square foot restroom with 51 sinks and 75 shiny white toilets where many of the 22,000 rolls of toilet paper are used up at the Minnesota State Fair. Above all else, ENJOY!